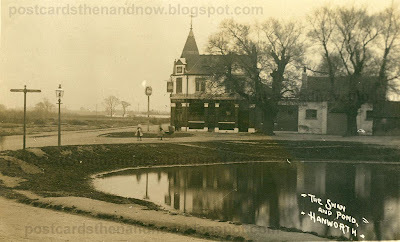 The pub is still there, but what happened to the pond? Edit - it looks like the pub has closed too. Shame. Was this the same pub used in the film "Danger by my side" & when was the upper part of the pub built?.....Roy. Yes it was Roy, filming mainly centred around the `Cement Gun` factory, renamed `ACME` for the film. The whole pub was built new in the 1920s, replacing the original `Swan` cottage pub!.